Checking the usual classifieds last night and I logged into Facebook Market Place and was getting ready to do my typical searches (Weber, Webber, Charcoal Grill, Grill, Asador...) when I glance at the first couple of listings that pop up organically and see a fire pit table listed below for $30. I know I've seen one before and I instantly know what it is, but couldn't remember what it was called. So I contacted the seller and she said she would put it by her front door for me to pick up in the morning and that I could put the money under the mat. Then I checked the classifieds once more and came across this 18" Lime on offer up and it was only a few more minutes down the road. So I picked it up too. Pretty excited. Not sure what I am going to do with the Flamenco but Im thinking full restore with professional sandblasting and powder coating on the table, not sure what to do with the grill. Its in absolutely perfect condition besides the faded paint, no dents whatsoever. What do you guys think I should do. Can I get it the porcelain enamel refinished? Re: Greatest Weber Day EVER!!! Put your phone on mute so you don't hear all the offers coming your way for that, oh except my offer !! Congratulations! 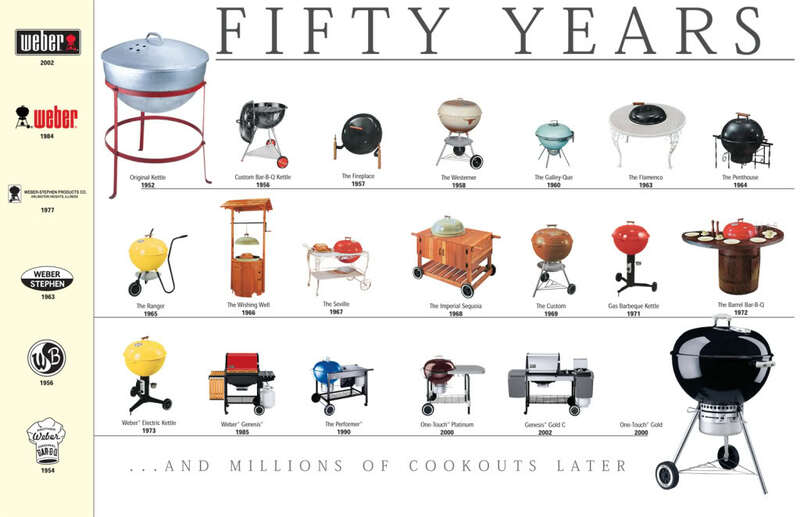 The only one I ever remember seeing was in one of those old Weber grilling newsletters. I think it was somewhere in northern Wisconsin. I often wonder how close I have been to that thing and not known it was sitting in back of someone's cottage as I drove by. Congratulations! Both are grate scores but that table is awesome! Holy smokes! An amazing day of scores! Congrats! So so very neat. I see the bowl of the flamenco has an ash catcher like the galley-ques. We definitely need lots more photos to perv! I wonder if the table was also made by Woodard. Appears to be. In the third photo, you can see it has the same ash catcher system as a Galley-Que. @azbeeking - I sent you a PM. Take some detailed photos and PM them to me. This Flemenco needs to be featured in the Grill Gallery, ponto! Holy schnikes! Your thread title isn’t an exaggeration! Amazing pickups! More pictures of BOTH please! Especially that flamenco!! While that Flamenco is cool, I love the lime! That's on my need/want list! Great scores all the way around! WHOA!!!! ‘63 Flamenco!!! And a lime!!! Score of the YEAR!!! First one I’ve seen in the wild!! Congratulations!!!! More pics and closeups please! And yes the Flamencos had the OEM Galley ash cans. That’s a grail for sure! I’d love to find one of these some day. That’s a cool grill. It’s the third flamenco we know of in the wild. Yes, they have the Galley Que ash catcher.